In the developed world, when it comes to our homes, conventional wisdom dictates bigger is better. But why? So we can spend years slaving away to pay off a mortgage for a house that may not appreciate in value? And then go further into debt furnishing and maintaining it, all the while saddling the planet with an environmental impact grossly out of proportion to our needs? And that’s if we can afford, or even find, the room. For much of the developing world, living space is at such a premium people spend ridiculous sums of money to live in quarters smaller than some prison cells. And they, too, slave away to keep even that. Submitted for your approval are 10 cases of living in small spaces, some ingenious and enlightened, others not. Smaller living may be coming into fashion, but it’s definitely not a new idea. 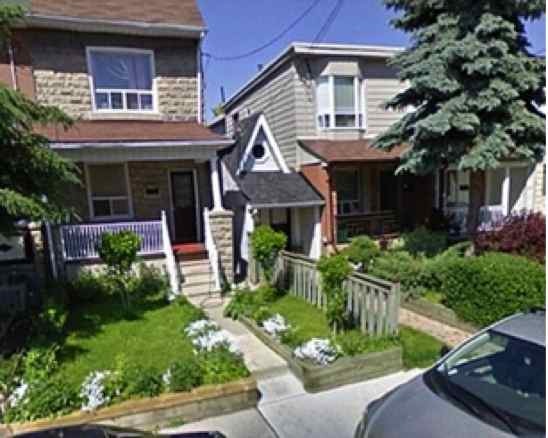 Sandwiched between two normal-sized neighbors, the Little House is the smallest home in Toronto, Canada. The land on which the house sits was originally designed as an alley for one of the neighboring homes. City officials never approved the curb cut, so in 1912, contractor Arthur Weeden decided to make use of the land and built a house on it (in which he and his wife lived for 20 years). With only 312 sq. ft. of space, the Little House is a neighborhood favorite, and stops traffic from time to time. American celebrity Ellen Degeneres was so won over by its charms, she expressed interest in one day owning it. An engaging and detailed history of the home can be found at The Little House Website. 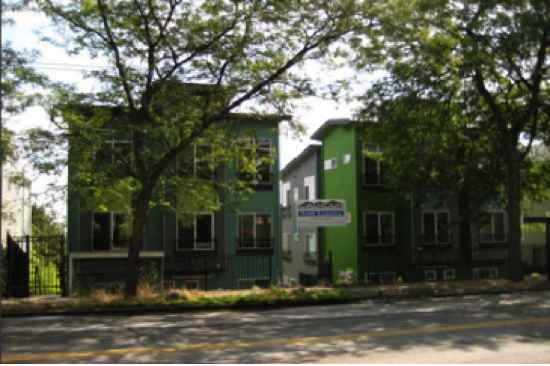 Located in the heart of Seattle, WA, Videré is a rooming house that’s getting big by going small. The rooms in the complex range from 90 to 168 sq. ft. The smaller units are only slightly larger than a parking spot. In 2009, developers converted New York’s 535 W. 110th Street building to a co-op. They gutted the top floor and carved out three decently sized one- and two-bedroom apartments, but ended up with 175 sq.ft. left over. They didn’t know what to do with the unused space, so they decided to make the “best smallest apartment ever”. The resulting “micro-studio” is 10 x 14 feet, with modern conveniences and a private bathroom. A queen-size bed would take up 20 percent of the entire living space. The flat is not without its quirks, either—to reach the front door, the tenant must exit the elevator one floor below and ascend a separate flight of stairs. The current owner paid $150,000 and uses the apartment as a premium pied-à-terre while in New York (thus saving a fortune in hotel costs). 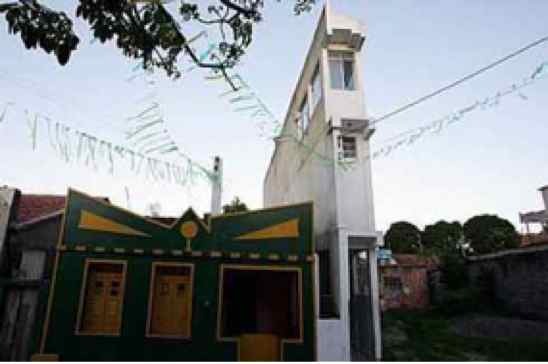 With no formal architectural training, Brazilian Heneita Minho designed, and still lives in, what many recognize as the narrowest house in the world. Her three-story home is a svelte 1 meter wide by 10 meters tall. It’s so thin she cannot fully extend her arms when she walks in the front door. Despite its radical appearance, the building is a fully functioning home with 2 living rooms, a kitchen, 3 bedrooms with washrooms, and a verandah. At first, city officials sought to block construction, but relented when the original plans were revised to a more conservative design. The house has since become a minor tourist attraction. Felice Cohen is a professional organizer, and she’d better be. That’s because she’s living in what many say is America’s smallest apartment. Her whole life must fit into a 90 sq. ft. flat, with no kitchen and a loft bed in which the ceiling is less than 2 feet from her face. The bathroom is so small she sits on the toilet sideways, and she had a panic attack the first night she slept in the apartment. So why does she suffer these indignities? The appeal is a mix of economy and location. The former Bronx resident pays just $700 a month to live in New York’s tony Upper West Side—Central Park and Lincoln Center are just blocks away. Her neighbors pay $3,000 a month for the same location. Cohen attributes her extreme frugality to her father, whom she remembered in ‘What Papa Told Me’. 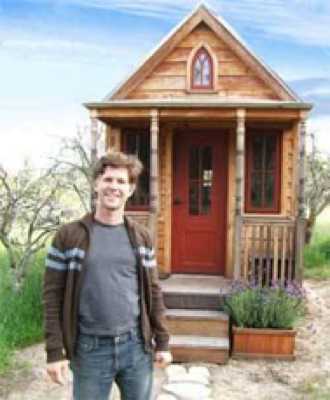 Jay Shafer is the creator and resident of what he claims is the smallest house in the world, affectionately named ‘Tumbleweed’. His decision to live in just 96 sq. ft. arose from his concerns about the environmental impact of a single person living in a larger house. Shafer’s entire home is smaller than a typical bathroom, but is still wired for electricity powered either by an AC plug or via a solar electric system with an inverter. It has a two-burner stove, an under-counter refrigerator, a bar sink, on-demand hot water heater, and a propane room heater. Tumbleweed is very well insulated, making it a dream to heat and cool. In fact, Shafer spent less than $170 to heat his tiny house during the brutal Iowa winter. He now sells plans for, and builds, tiny homes from 50 to 500 sq. ft., all available for purchase from his website, Tumbleweed Houses. Life in Hong Kong can be cramped and hostile, and nobody knows that better than architect Gary Chang. So he transformed his tiny one-room apartment (which once housed his whole family and a renter) into an innovative, eco-friendly space that can transform into 24 different configurations. Spatial flexibility is achieved through the multiple operations of clever partitions. Mr. Chang hopes his home’s innovations can improve domestic life in Hong Kong, where the population grew by 500,000 in the last 10 years. Reports of child, spousal and elder abuse have doubled recently, and social workers attribute this rise, in part, due to social pressures caused by the city’s ongoing space shortage. In Beijing, affordable housing is hard to find, if you weren’t already born in it. Dai Haifei, 24, learned this after landing a job at a Beijing architectural firm after college. 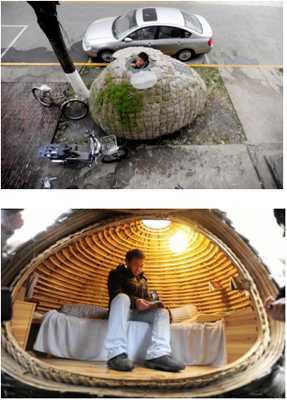 Unable to afford rent, he built a tiny egg-shaped mobile house and parked it on the sidewalk outside his office. The 2 meter tall egg cost 6400 Yuan ($960 US) to build, and was made of bamboo strips, waterproof materials and sacks stuffed with processed wood shavings. Grass seeds covered the exterior walls and roof. It even had a window for natural light and solar panels to generate electricity. Inside were a single bed, a bookcase and a pressurized water tank for hygiene and sanitation. Living in the egg was easy, since Dai built it to perfectly suit his needs: he worked until midnight each day and returned to the egg only to sleep or relax. A nearby gym provided shower facilities, and he ate at nearby restaurants. Neighbors were impressed with the young man’s ingenuity, diligence, and green construction methods. Sadly, on December 1, 2010 the Haidian District Urban Management Division decreed that any roadside building without a permit is considered an “unauthorized construction” and must be removed. Two days later, nearby restaurant employees noticed office personnel moving the egg at 8 p.m (while Dai was working). Dai wouldn’t comment except to say that he would sleep at a friend’s house that night. Originally built for the urban poor, “capsule apartments” are a new alternative for Chinese singles desperate for affordable urban housing. The first versions (top: that’s TWO units, not one) were barely larger than a closet, had a chain-link ceiling, offered 2 square meters of space, and cost 230 Yuan a month. For that the tenant got a single twin-size bed and a wall shelf. 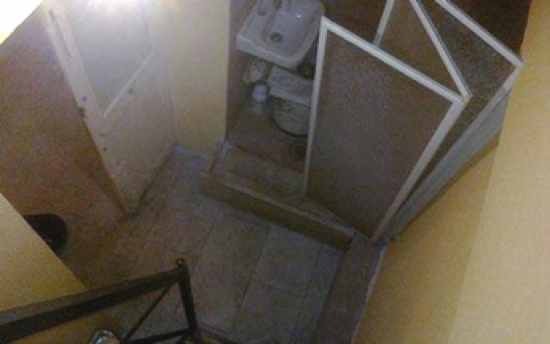 Pictures of the apartments hit the Internet, and embarrassed officials destroyed the flats for violating a hastily drafted regulation for a minimum 10 square meters for personal living space. 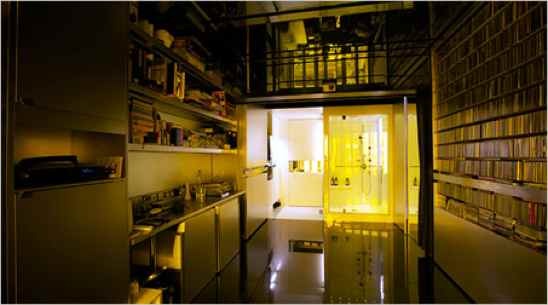 Original architect Huang Rixin (retired) has now returned with Capsule Apartment 3.0 (bottom), which meets the new code and costs only 200 Yuan a month, easily within reach of people with monthly incomes of only 1,500 – 2,000 Yuan. The new apartments cost only 3,000 Yuan to build, with costs dropping substantially when mass produced. Mr. Huang has repeatedly stated he has no commercial interest in the capsule apartments, and only wants to provide affordable housing for the next generation. The recognized smallest apartment in the Western world is a former porter’s closet in the heart of Rome, offering a mere 55 sq. ft of living space. The flat consists of a ground floor bathroom, shower and sink. A ladder grants access to a sleeping platform just large enough for a single twin-size bed. The tenant must climb over the bed to see out a small window. The apartment is generously described as a “compact bedsit”, and the leasing agent claims several serious inquiries. The appeal is location: the flat is very near the Piazza di Sant’ Ignazio, a gorgeous city square overlooked by a Renaissance cathedral. Just a block away is the Palazzo Grazioli, the current mansion/private residence of Silvio Berlusconi, the Italian prime minister. And it can all be yours for 50,000 Euros. It helps if you don’t think of how many capsule apartments that could buy.